Since I planted what has turned out to be a ton of fresh herbs on my deck, I have been on the hunt for recipes in which to use them! Fresh thyme is a great addition to a basic lemon vinaigrette in this dish. We ate this warm as a side dish with grilled steaks last weekend. The flavors are bold, so I wasn't sure if my girls would eat it, but they gobbled it up! There were a few leftovers and I ate it for lunch the next day (cold). I think it would make a great dish to take to a picnic! In a large pot of boiling water, cook pasta according to directions. During last 3 minutes of cooking, add green beans. Drain pasta and green beans. To make the dressing combine Thyme, Lemon Rind, Shallots, Vinegar, Salt, Pepper and Garlic in a bowl. Slowly whisk in the Olive Oil. 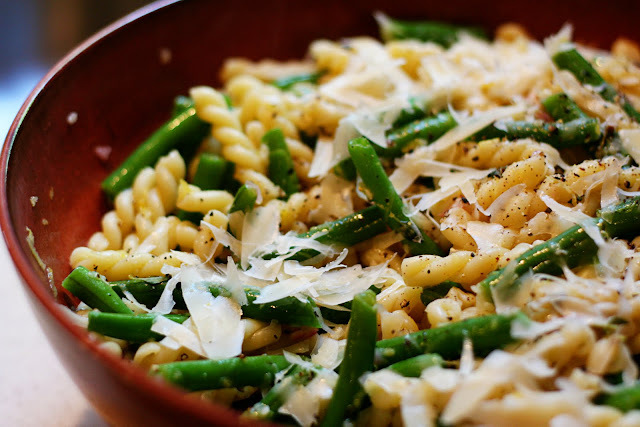 Drizzle the dressing over the pasta and green beans. Stir to combine. Garnish with fresh parmesan cheese.